Read Norwegian fairy tales from the collections of Asbjørnsen and Moe, Andrew Lang and more. Jump to full list of Norwegian fairy tales. About: In the 1300s, The Black Death touched two-thirds of Norway’s population, which left them economically and politically disadvantaged for years. With the deaths of so many of their clergymen, who also happened to be the few people at the time who knew how to write, Norwegian literature and folklore would remain an oral tradition for a good 250-300 years more. During the Middle Ages, the rest of Europe was writing down poetry and prose, but Norway had only their oral traditions to rely on for the preservation of their history, customs, knowledge and stories. 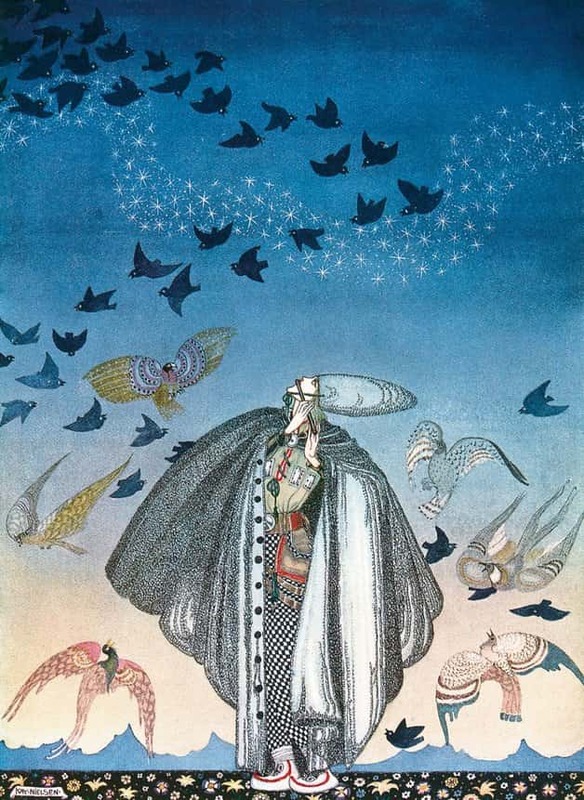 “No sooner had he whistled than he heard a whizzing and a whirring from all quarters, and such a large flock of birds swept down, that they blackened all the field in which they settled.” Illustration by Kay Nielsen, published in East of the Sun and West of the Moon: Old Tales from the North byAsbjørnsen & Moe (1926? ), George H. Doran Company. Considered national heroes, authors Peter Christen Asbjørnsen and Jørgen Engebretsen Moe set off across Norway in the 1800s and collected the folk tales of their people, creating an internationally recognized collection of folklore, a landmark in Norwegian literature and language, and a boon to the fairy tale world. They considered themselves “compilers and retellers,” as indeed they were, as they expertly helped create an autonomous Norwegian written language. The numerous dialects of Norway were too vast and complex for a national collection of folklore, so Asbjørnsen and Moe, inspired by The Brothers Grimm, simplified the language while not losing the national heritage and uniqueness of the tales. Norwegian folk tales breathe life into the glaciers and fjords where spirits dwell and trolls make their homes. Simultaneously grotesque and quaint, Norwegian fairy tales are anything but a nursery or children’s story. Sometimes Norwegian fairy tales are downright scary, but in being so, they are also gripping and exciting. The wild animals of Norway, bears and wolves, foxes and salmons, give aid to industrious and kind folk in need, and often know all the secrets of the land and machinations of the trolls and giants. Norwegian fairy tales wouldn’t exist without princes and princesses, beggars who become kings, and wicked stepmothers who pay for their cruelty; they are tales of unlikely heroes, and intrepid underdogs, of spell reversals and seeking one’s fortune.